Vertical axial flow propeller pumps are of rugged, heavy-duty construction designed to operate in a multitude of applications requiring the movement of a high volume of water at a low discharge pressure. They are used extensively for pumping water from sources including lakes, cooling ponds, tanks, rivers and oceans. 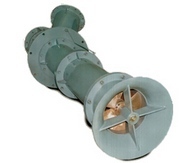 An axial flow pump, or AFP, is a common type of pump that essentially consists of a propeller in a pipe. The propeller can be driven directly by a sealed motor in the pipe or mounted to the pipe from the outside or by a right-angle drive shaft that pierces the pipe. The main advantage of an AFP is that it can easily be adjusted to run at peak efficiency at low-flow/high-pressure and high-flow/low-pressure by changing the pitch on the propeller (some models only). Applications for axial flow propeller pumps include raw water intake, dewatering, storm water removal, and flood control. These applications are found in a variety of markets including: urban and rural municipal water, government, industrial and irrigation and more. 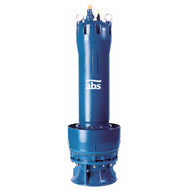 Submersible axial flow pumps for direct installation in discharge pipes save space and installation costs. They are intended for large flows and moderate heads for storm water, land drainage and flood protection. The AFLX can handle sewage from commercial, municipal and industrial sources. Thanks to its semi-open impellers, trouble-free pumping of liquids containing solids and fibrous material is ensured. The compact units are lowered into standard steel tubes and need no anchoring. Their own weight is sufficient to hold the units securely in position. The robust design and quality materials ensure high operational reliability and hydraulic efficiency up to 88%. Parameters of vertical pumping applications require the units be available in a variety of pumping configurations to meet user needs. Our suppliers meet these demands by providing pump bowls from 8" to 152" in diameter. Propeller bowls can be single-stage or double-staged in series to produce the necessary discharge pressures. The successful application of vertical mixed flow propeller pumps requires the consideration of many elements. In addition to knowing the capacity and discharge head requirements.